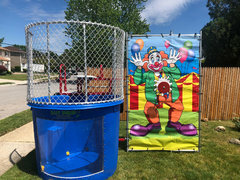 Be ready to have a blast with one of our amaizing dunk tanks. Here at Party rentals R Us, we love dun tanks, that's why we carry many of them. 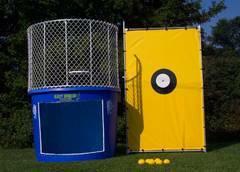 We carry two types to choose from, we have the traditional dunk tanks and we also have the spacesaver dunk tanks. 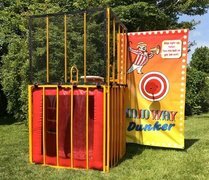 With the spacesaver dunk tank, we can bring them into backyards with less than 6ft opening recuarred with the traditional dunk tanks. All our tanks are large commercial grade with a viewing window to see the person in the water. All our dunk tanks are new and come clean, they stored inside our warehouse so they're not rusted.